Auphorie is a small perfume house based in Malaysia; it's run by two brothers: Eugene and Emrys Au. Recently, many bloggers have written (excitedly) about Auphorie's limited edition Miyako1 so, of course, I had to try it. Miyako goes on smelling like a rich fruit syrup, not an 'ordinary' syrup, but one concocted (with secret ingredients) at a lavish Parisian restaurant for use in over-the-top desserts and cocktails. Miyako's syrup is made mostly of ripe stone fruit — heavy on peach and apricot. Miyako's fruit accord begins to dry rather quickly and the perfume becomes a tad talc-y before the arrival of moist osmanthus blossoms and a smooth leather aroma. Auphorie's heart developed differently on me each time I wore it; sometimes I caught a sniff of smoke/incense, other times gentle (non-animalic) musk was present. On one memorable wearing, Miyako's mid-development smelled like pulao, a dish prepared with buttery basmati rice, saffron, dried fruits and nuts. 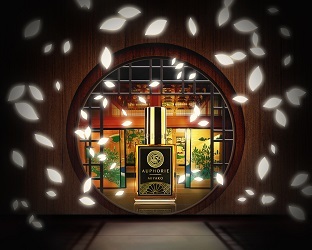 After its enticing opening and mid-notes, Miyako broadcasts fruity sandalwood till the fade-out (Miyako lasts over seven hours on my skin, and days on fabric). Once, I used a half ml of extrait and I was a walking-and-talking smudge stick (scenting all of downtown Seattle). Miyako, in its early phases of development, has sensational sillage. Miyako is a feminine name in Japan, but Miyako the perfume could be worn by men...what's scary about sandalwood, peach and osmanthus, after all? Miyako's overall character, not its specifics, reminded me immediately of Tom Ford's more complex Fleur de Chine. Perhaps Miyako, given its apparent popularity, will join the permanent line-up at Auphorie? Miyako is not my favorite in the Auphorie line; I'll review that scent later in the summer. 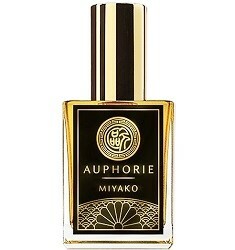 Auphorie Miyako is $110 for 30 ml Extrait and is available at Auphorie or Tigerlily Perfumery. 1. Listed notes of apricot, yuzu, peach, osmanthus, jasmine green tea, leather, cedar, sandalwood, hinoki, patchouli, katsura leaf and musk. “I was a walking and talking smudge stick”…..PRICELESS and beyond hysterical! Thanks for this review…I had been very curious about this one given its adoration by bloggers and wearers. chocomarzipan: I was SO self-conscious that entire day. I was curious to try this one, as I was looking since a long long time for a lush and rich osmanthus perfume (as opposed to bland and/or squeaky clean). Thanks for the review! I think however I’ve found my perfect osmanthus fix in “absolue d’osmanthe” by Perris… Very floral and leathery aiind rich…and apricotty…have you tried it? I’ve been looking forward to trying that Perris. Zazie, nope…but I’ll add to the list for sure. Miyako is the richest osmanthus I’ve tried – but what’s this about Perris? Must sample! Nice to see you, Zazie! Have you been away, or is it just that have I haven’t been reading as closely lately. Thanks Nozknoz! I’ve been trying to keep up with the reviews but somehow had trouble finding time to comment. OMG How did I miss this? It sounds like instant love. I must acquire some immediately! Though I’ll behave and grab a sample first, I suppose. How limited are we talking, Kevin? Especially if it’s proving quite popular? Thanks for the review. Off to go find some! AbScent: Tigerlily in SF has samples and bottles…no timeline on the “limited” that I know of. Does it smell like an actual osmanthus bush? Very rarely an absolute smells like the actual thing. Mainly because you loose aromachemicals emitted by the living flower in this process and this shifts somehow the balance inside the aroma. I would say that this might not smell like the bush, but it does smell a lot like the original absolute, which is very clear in the fruit nuances. Also, the constant emission of the more volatile aromachemicals by the plant is a main factor of its smell. Even that you capture all the volatiles in a headspace process and reproduce in laboratory the best scenario you’ll have is a more faifhtful reproduction for some moments only. In a perfume, they evaporate and you can’t “produce” them again as a plant can. OK, this review pretty much confirmed that we’re evil scent twins with a few exceptions (Immortelle de Corse and Coromandel). Miyako was dank moldy wet basement to me. I read other reviews that suggested this is a chameleon so I have not lost hope (I think). Yeah, I get the mouldy wet basement accord too. It gets danker as the perfume develops. Almost no fruit. Sillage and longevity only average. It’s so weird how our perception of perfume varies. I wish I could smell what other people are smelling because as Kevin says, the price is very reasonable. Elisa: it won’t be long. HA! I enjoyed Miyako very much, too. It’s obviously such high quality ingredients, and the Auphorie people were so nice when I ordered the sample. I probably won’t buy it because it seemed a lot like two other osmanthus-leathers that I already own: SL Daim Blond and DSH Mata Hari. Hence, I’m REALLY looking forward to learning which one you liked best. Too much editing – maybe not “a lot like” – but related enough that I don’t need three of them. Those who don’t have one already would not go wrong with this one. Miyako is a Japanese girls’ name, but it also means “capital city” (different Chinese characters), which I think is where Auphorie was headed, based on the description on their web site. I really like Miyako and am glad I got a bottle. I’m curious what your favorite of their line is, though. Can’t wait for your review. Furriner: it’s also such a great price for an extrait! I haven’t tried anything from this line, but your review is making me very curious. I love osmanthus and buy jars of the dried flowers for tea (I sometimes just like to open the jar and inhale), but I don’t have much osmanthus in my perfume collection. Sweetgrass…if you can’t smell osmanthus flowers on a tree, try buying a few drops of osmanthus absolute so you can get a feel for the natural aroma of osmanthus fragrans…so many perfumes replicate this scent using apricot/peach notes. I haven’t encountered the actual plant, but once I get settled into my new house and can start getting my garden set up, I’m thinking about trying to grow one. sweetgrass: they’re finicky where I live in Seattle…I think they’d prefer warmer climes. The leather and fruits are mostly due the use of osmanthus absolute. Osmanthus has this riped fruit aroma and the greasy leathery impression as part of its smell (the fruit one mainly due the presence of gamma-decalactone, beta-ionone and beta-damascenone). Miyako is very osmanthus centered in this sense, the flower impression permeates it from the beginning until the end. Rick: the peach-apricot did last all day on me, but I never got a strong leather aroma from Miyako. I think I’ll layer it next time with a more leather-focused scent to see how it goes. You never came back to tell us which one was your favorite from the line!